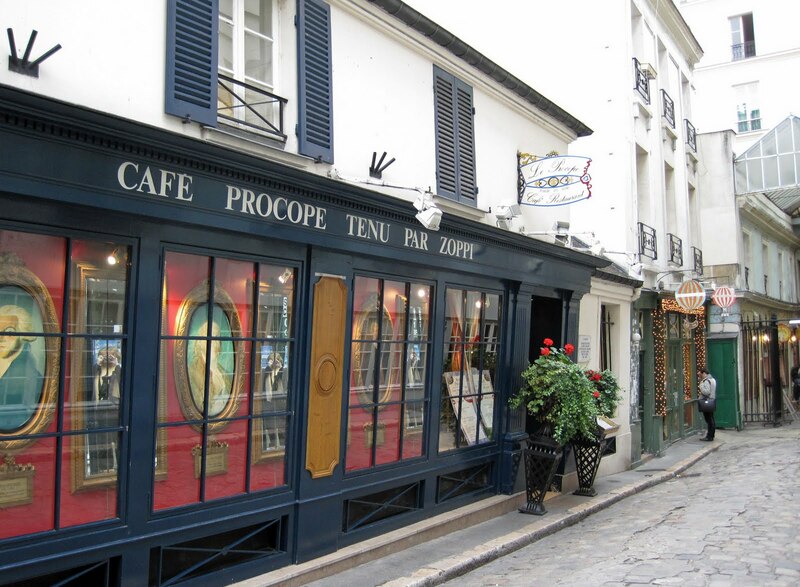 A few years ago Joe and I decided to try Le Procope, at 13 rue de l'Ancienne Comédie, in the 6th. I had read about this restaurant beforehand and found the history fascinating (I hate this overused word but it applies). If I was forced to eat gourmet food and sit in a traditional/formal decor to experience the feeling of the past, so be it. Billed as the oldest restaurant of Paris in continuous operation, Café Procope first opened in 1686. It survived the French Revolution when everyone around was losing their heads. Robespierre, Danton and Marat all went to the café and had meetings there. What more do you need? History and food! Our meals were terrific. I can't remember what I had for the main course, and Joe couldn't even recognize his appetizer, but we enjoyed whatever it was we ordered. My favorite part was dessert. That I remember! Of course, that's the same with every meal I've ever eaten. 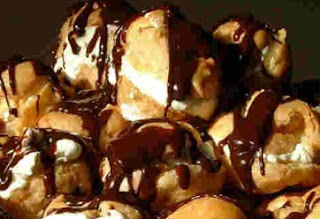 Profiteroles au chocolat chaud are a weakness and Le Procope came through with flying colors. I also remember the man sitting next to us was having something very exotic looking after the meal - had something to do with coffee, or maybe a digestif, but it involved some sort of equipment we had never seen before (or since). Something fancy was going on and I didn't understand what it was! But there you go....that's a good enough reason to return! Profiteroles Recipe (No I haven't tried - are you kidding)?